When the Mercy Health Perrysburg Cancer Center opens to patients Monday, those behind it say they are ushering in a new era of comprehensive cancer care in the Toledo area that is patient-centered and locally focused. The $14.5 million facility at 12623 Eckel Junction Rd. is adjacent to Mercy Health Perrysburg Medical Center and brings together Mercy Health and the Toledo Clinic to offer outpatient oncology services. 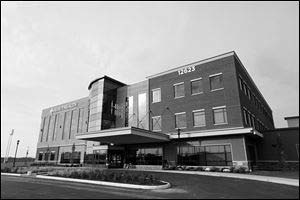 Toledo Clinic oncologist Dr. Rex Mowat, who will direct the medical oncology and infusion services for the new center, said it will provide more local options. An estimated 20-25 percent of patients in northwest Ohio leave the area for cancer treatment, he said. The idea is to give patients as much of a one stop shop as possible when it comes to outpatient care, including diagnostics, radiation, chemotherapy, and surgical consultation, he said. The new center has 16 medical oncology exam rooms and seven radiation exam rooms. For some patients, surgery is required and they will be treated elsewhere, Dr. Mowat said, but as cancer moves more toward outpatient care, the treatment options offered at the new center allow patients to stay local and maintain a more normal schedule. Dr. Imran Andrabi, president and CEO of Mercy Health-Toledo, said the facility fits well into Mercy Health’s mission and vision. About 40 employees, including medical and administrative staff, will work in the building. Twelve medical oncologists and six nurse practitioners from Toledo Clinic will join, as well as 13 radiation oncologists from Toledo Radiation Oncology. The center occupies 40,000 of the 60,000 square-foot building; the third floor and other space is undeveloped and closed off for future expansion. Barry Bagels will serve breakfast and lunch at a cafe on the first floor. The facility has 16 medical oncology exam rooms and seven radiation exam rooms. Chemotherapy patients will be treated in 18 semiprivate bays named for Perrysburg landmarks and equipped with televisions, wireless internet, and seating for family or friends. There are also three private rooms and a group seating area for those who want to get their treatments together. A linear accelerator machine will provided targeted radiation procedures. Officials project more than 35,000 will be treated in the cancer center’s first year. 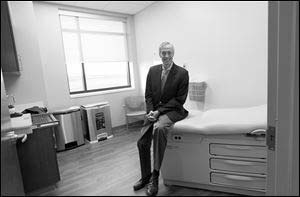 Dr. Rex Mowat sits in a consultation room during a tour of the Mercy Health Perrysburg Cancer Center on November 2, 2016. Ancillary services work to complement cancer treatment for a comprehensive care plan, said Michelle Rowe, oncology service line leader for Mercy Health-Toledo. That includes a dietitian, social worker, chaplain, financial counselor, and physical therapists. The center also will help with transportation and provide educational resources for patients and families. Works of art around the facility add a personal touch to an often sterile reputation for cancer treatment. 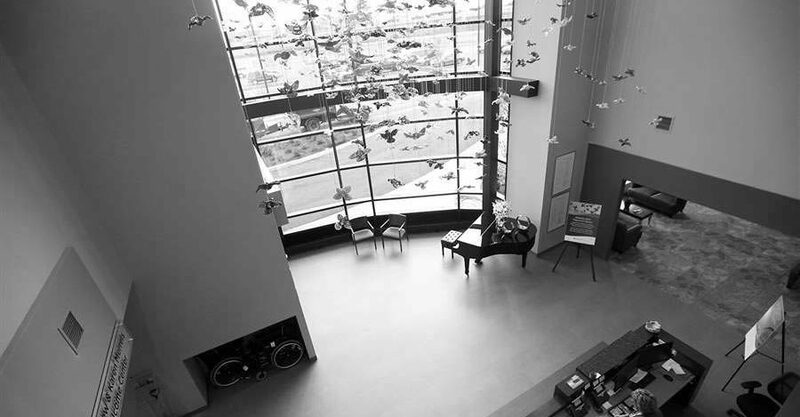 Dozens of colorful glass birds hang in the entryway to the Andrew and Karen Merrels Welcome Center. The birds, in colors representing various cancer support ribbons, are a gift from Mrs. Merrels in honor of her husband, who died of cancer in 1994. A large gong, donated by Laura Rudolph, waits for patients to complete their treatments and ring it in celebration. Mercy Health’s new center joins the Eleanor N. Dana Cancer Center, which has a similar concept on the campus of the University of Toledo Medical Center, the former Medical College of Ohio. ProMedica operates the Hickman Cancer Center at ProMedica Flower Hospital, which primarily offers outpatient radiation and chemotherapy treatments. Construction on the Perrysburg center began last year. Rudolph/​Libbe Inc. was the construction manager. The public is invited to tour the new facility during an open house and blessing to dedicate the building from 1 to 3 p.m. on Sunday.